After designing a table setting, I usually like to change out the decor in the rest of the room so that it will tie in with the theme of the table and the centerpiece. The table setting includes greens, and pinks and whites so it was important to me to coordinate the vignettes with this color palate. 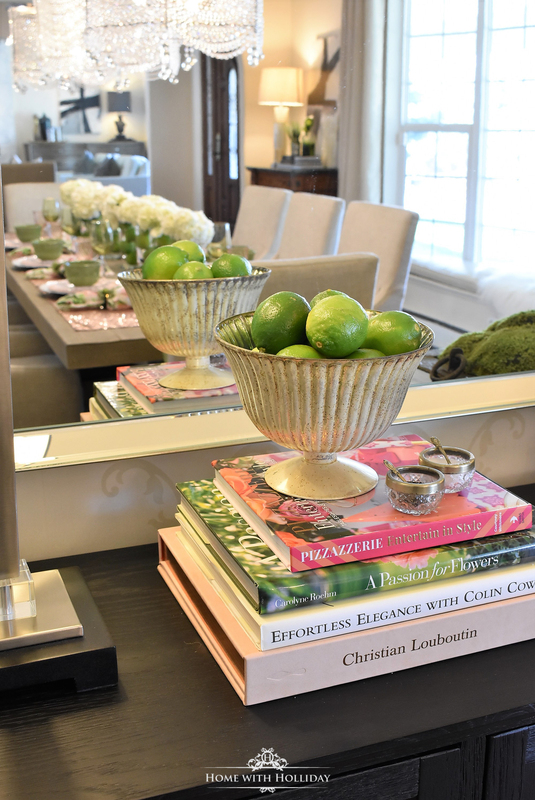 On the buffet, I simply added some colorful coffee table books and topped them off with a beautiful compote with a few more limes. So easy, but fresh and “springy” for sure. Additionally, these books absolutely represent some of my biggest passions. I have read each of these cover to cover and highly recommend them not only for their content but also for their beauty. This is one of my favorite shots because of the reflection of the table in the mirrors. It is quite difficult to shoot pictures with mirrors involved, so capturing this one was super fun! Moving onto the Butler’s Pantry area, I first simply added another of the same arrangements I created for the dining room table. They were super easy to make and very inexpensive. Next, I just added in a few color-coordinated votive holders to the existing tray that sits on the countertop every day which features a few of my apothecary jars. As I mentioned, this floral arrangement was incredibly easy to make and very inexpensive. I shared the details in my last post. Basically, I made them using a simple clear cylinder vase (cost…$1.00), added in a few fresh limes and then the hydrangeas. There are so many ways to create this look but with different fruit or flowers. For example, for Memorial Day, you could use strawberries and blue hydrangeas. Making several of them created a very dramatic centerpiece for the table setting! The total cost of this centerpiece…$56.00!! Eight 9″ cylinder vases (from Dollar Tree) @$1.00 each, six bags of limes (from Trader Joe’s) @$1.99 each and six bundles of hydrangeas (from Trader Joe’s) @ $5.99 each. Plus, this could be totally scaled down for a smaller table and cost even less. Once spring began to pop its little head out, I did a little refresh on my coffee tables in my main living room. I simply scaled back a few of the accessories and added fresh flowers that coordinated with my Easter Table Settings. You can see them in my recent Easter Home Tour post. Finally, I only made one simple change to this vignette in my dining room. I just plopped in this darling little faux Lilies of the Valley plant to give it a touch of spring. The antique green bottles were already there and they tied in perfectly with the green tones on the table. Sometimes, just a tiny change can easily update an area for the season at hand. Thank you for stopping by today to read about these simple spring home decor ideas! Spring is such a great time of the year to refresh certain areas of your home, both inside and out. If you are still looking for Mother’s Day gift ideas, check out my Gift Guide of All Things PINK!